Back at it again with another round Comic of the Week! Stargazer’s Gate – Atrina Vilanar discovers an alien civilization on the other side of a strange gate! Alien to Atrina, at least. People on the other side seem to recognize her. Back home, Leawyn still believes Atrina is alive, and will do anything to find her. 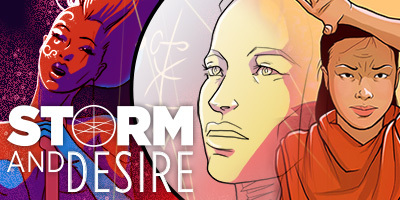 Storm and Desire – Three women’s fates collide as they uncover the secret history of the multiverse.